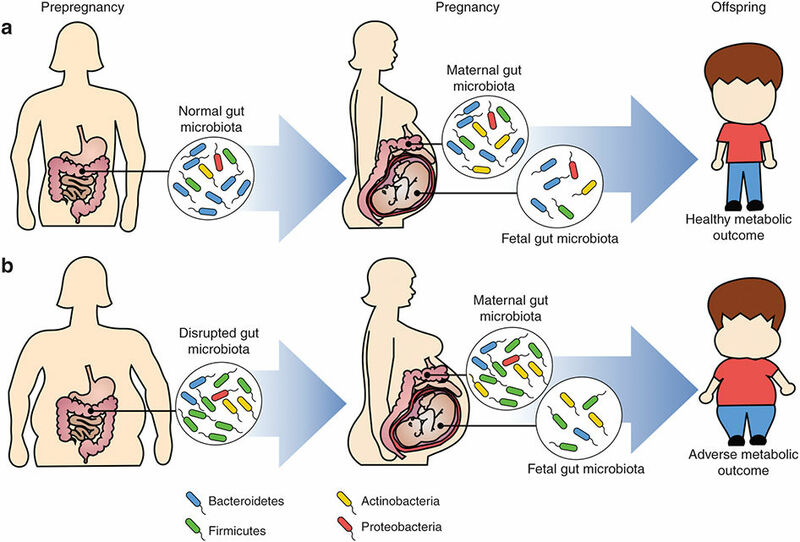 During pregnancy, a woman’s gut microbiome goes through many dramatic changes. One of these is how a woman’s gut will naturally become dysbiotic (or imbalanced) in her third trimester: certain bacterial colonies become fewer and less diverse, and more bad bacteria are temporarily present. Specifically, researchers observe increases in the abundance of Proteobacteria and Actinobacteria, which are strains commonly seen in inflammatory bowel disease. (5) It’s thought that this temporary dysbiosis somehow helps prepare mom for birthing, although it’s still not exactly known. However, what happens if you already have gut dysbiosis before pregnancy? Does this affect the course of your pregnancy? Therefore, it’s important to make sure your gut is well-balanced before pregnancy to set yourself and your baby up for the best possible outcomes! Being at a healthy weight before becoming pregnant is a great way to help ensure better metabolic health for your baby. (Not sure if you’re a healthy weight? You can use a BMI calculator to gauge where you are). Dysbiosis is a big problem when it comes to metabolic health (which I’ve discussed before here). When you have dysbiosis, you develop intestinal permeability and chronic, low-grade inflammation that is highly associated with metabolic health issues, such as obesity, insulin resistance, and diabetes. And not only does obesity impact your own health, but it also has both short- and long-term consequences for your baby. For instance, one study found that the infants of obese mothers had greater percent body fat and had already developed insulin resistance in the womb. Obese women also have a higher risk of developing pregnancy complications and metabolic diseases, such as increased risk of miscarriage, increased risk of C-section delivery, gestational diabetes, hypertension, and preeclampsia. (16, 17, 18) All of these can greatly compromise infant health outcomes. Source: Gohir, W., Ratcliffe, E. M., & Sloboda, D. M. (2014). Of the bugs that shape us: maternal obesity, the gut microbiome, and long-term disease risk. Pediatric research, 77(1-2), 196-204. (A) depicts a woman with a normal body weight that possesses a stable, healthy gut microbiota which changes over the course of pregnancy. Women with a normal body weight are more likely to have balanced gut bacteria. It is proposed that this balance helps facilitate normal gut development and function in the baby, and helps the baby regulate a healthy body weight. (B) depicts an obese woman, who is more likely to present with disrupted gut microbiota already before pregnancy. This imbalance is further amplified through the course of her pregnancy. This imbalance could also lead to poor or altered gut development, adverse metabolic health outcomes, and mediated increased chronic disease risk for the baby. 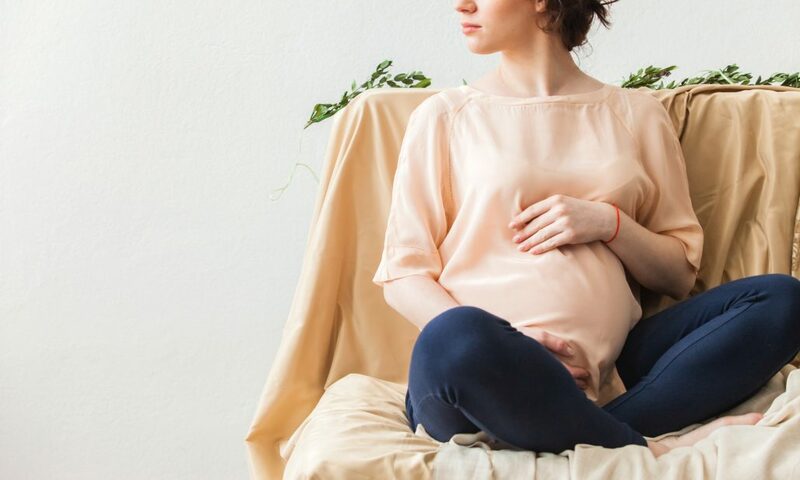 As you can see, managing your body weight by developing a balanced gut before becoming pregnant is essential to make sure you’re passing down a healthy gut to your baby. By now, you understand that it is important to start your pregnancy off by having balanced gut bacteria and being at a healthy body weight, both of which go hand in hand. Get your gut tested. Especially if you already feel like you have symptoms of gut dysbiosis, it’s important to start dealing with this before pregnancy! But even if you don’t have any digestive symptoms, you can still have dysbiosis, and it’s important to get tested before becoming pregnant. Check out the last section in my article for more information about testing. Eat a diet with plenty of plant matter, high-quality meats, and fat. Eating lots of fruits and vegetables that contain polyphenols and fibers can help you get those prebiotics into your diet. Healthy fats include olive oil, avocado oil, pastured animal fats, and coconut oil. I discuss all of this (and more) in my 8-week digestive health program, Build Your Biome. If you’re thinking about starting (or expanding) your family soon, BYB is a great way to go through all the steps to take care of any gut bacteria imbalances before you become pregnant. Or, if you want to just dive a bit deeper into all things gut-health, check out my free 60-minute training on digestive issues! Click here to get access to that. For those of you who are preparing to get pregnant or have had kids — did you consider your gut health? Tell me in the comments!